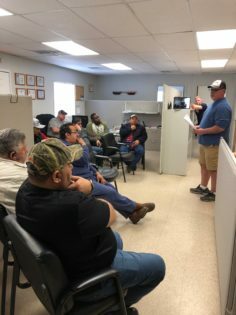 On January 19, 2019, Pulido Transport held its First Quarter Drivers’ Safety Meeting. The meeting was held in both the Houston and Beaumont terminals connected by video. The meeting consisted of topics such as safety policy updates and operational revisions to further enhance our safety culture across the Company. Also, the drivers were provided with customer updates. As said by Joe Pulido, Founder and President, “The meeting provides the drivers with a great way to ask questions and obtain clarifications in person.” Breakfast tacos from El Ultimo Taco Truck were enjoyed by all!